We're a member of the BVfK, the federal association of independent car dealerships in Germany. Members of the BVfK commit themselves to meeting or exceeding high standards of respectability and reliability. They stand for quality and safety in the car market. BVfK fights for objective, independent advice, and offers an ombudsman service that is free of charge for the consumer. As a member of the BVfK, we also guarantee the correct mileage of our vehicles as shown on the odometer. That's how our BVfK membership contributes to your ability of relying on our promise: to deliver premium quality in everything we do. 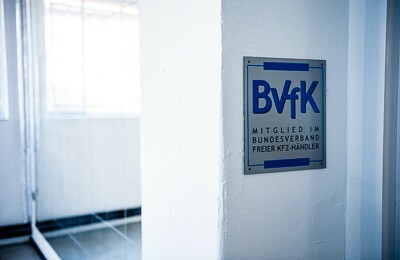 The BVfK membership plaque in our showroom in Bonn.